The U.S. Supreme Court is not a unitary actor and it does not function in a vacuum. It is part of an integrated political system in which its decisions and doctrine must be viewed in a broader context. In some areas, the Court is the lead policy maker. In other areas, the Court fills in the gaps of policy created in the legislative and executive branches. In either instance, the Supreme Court’s work is influenced by and in turn influences all three branches of the federal government as well as the interests and opinions of the American people. 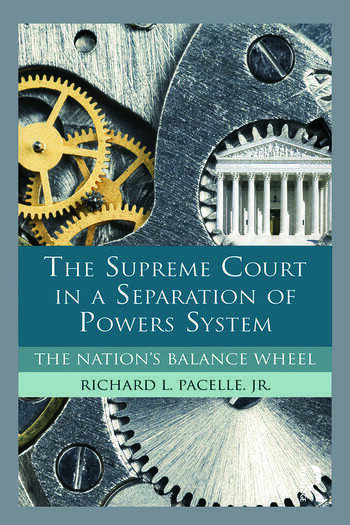 Pacelle analyzes the Court’s interaction in the separation of powers system, detailing its relationship to the presidency, Congress, the bureaucracy, public opinion, interest groups, and the vast system of lower courts. The niche the Court occupies and the role it plays in American government reflect aspects of both the legal and political models. The Court has legal duties and obligations as well as some freedom to exercise its collective political will. Too often those studying the Court have examined it in isolation, but this book urges scholars and students alike to think more broadly and situate the highest court as the "balance wheel" in the American system. Richard L. Pacelle, Jr., is Professor and Head of the Department of Political Science at the University of Tennesse. His research focuses on the U.S. Supreme Court and he is the recipient of numerous awards for both teaching and scholarship. "The splendid isolation in which the Supreme Court operates is a myth, as this volume makes clear. A range of external actors and influences affect the behavior of the Supreme Court, and failing to properly appreciate this fact runs the risk of seriously misunderstanding the institution. Professor Pacelle offers readers a comprehensive view of the Court in context, one marked by both depth and breadth, and does so with his usual flair and style." –Wendy L. Martinek, Binghamton University.